I often get emails regarding how I get the matte surfaces on my pots. Thought I would share a bit of that info here to answer some of those questions (even though I love hearing from y'all!) If you don't catch it in the slides I use a midrange red clay (fires to cone 3/4) made of clay that is currently available to me in Montana- I reformulate when I move. The glaze I use is a commercial glaze that I have tested (lots of colors and temps) to work in the circumstances below. I use a mid range red clay- that is close to vitrified at cone 3/4. All work is made and goes into the kiln to be bisqued in its natural green state. No slip is added at this point. I tend to make in series and try to fill a large gas kiln with work that will take a while - 3-4 electric kilns worth of glaze firings. 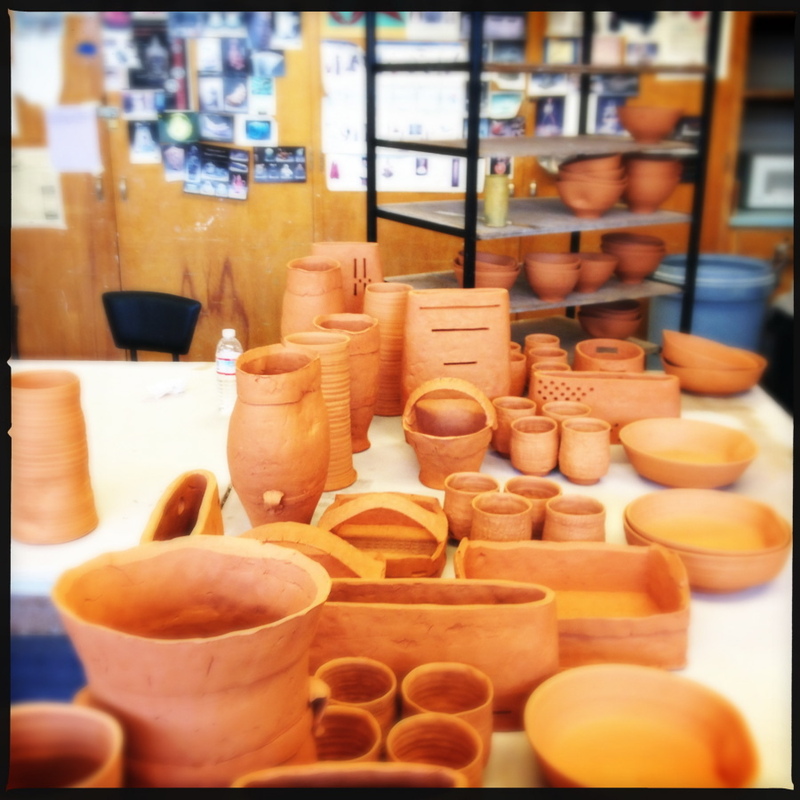 I unload the bisque kiln and separate work into 5 equal sections - 5 colors choices- make sense! I paint on my glazes - I use commercial glazes a low fire 05 glazes. When I unload the kiln only about half my job is done- time for sandblasting! The purpose of the sandblasting is to take off the top thin layer of shine on the pots, leaving a matte surface that is still rich in color. There is often a bit of prep work for the the pots with a wide open spaces. As not to damage the interior surface of the work that will come into contact with food, the insides of the pots get masked off with duct tape before they go into the blaster. Not all sandblaster are created equal! Here is my friend Tri using a favorite sandblaster of mine! They come in lots of different sizes, shapes, and styles. This is often my view, I tend to work on 2-4 pieces at a time. Slowly but surely getting through my kiln load. If you can believe it, not done yet. Now to soften the surface with some hand sanding, I use wet/dry sandpaper and 3M dipads to create a very soft supple surface for each pot. Now to take pictures, send to shows or shops or put online! Here is a video of the sandblasting process as it applies to my work. Enjoy! If you have any questions please feel free to drop me a note! Please fill out the form below, look forward to hearing from you!